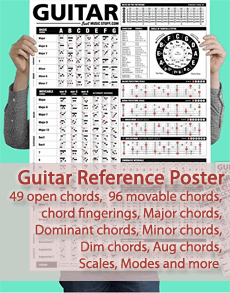 Chart with barre chords. When it comes to barre chords there are two shapes for every chord, with the bass note on different bass strings. The motivation for learning two positions for every barre chord is that it makes the movements over the fingerboard smaller. As shown on the pictures, the shapes are movable and all you need to memorize is the fret numbers. Read more about the theory behind barre chords.